That’s certainly an arresting disc title. So the first question must concern Gualberto Magli. A pupil of Giulio Caccini, he was one of the Medici family’s favourite singers, entering their service in 1604. He sang in the premiere of Monteverdi’s L’Orfeo in Mantua, almost immediately afterwards performing at the wedding of Cosimo Medici. Later Magli left Florence, entering the service of the Elector of Brandenburg. Magli died in 1625 and is buried in his native city, Florence. This homage illustrates his importance as a singer, most notably through L’Orfeo but also via arias from both Giulio and Francesca Caccini that reflect his stay in Florence. It also explains the presence of Sigismondo d’India’s two pieces in the programme. This, then, serves as a kind of musical portrait of a musician of great significance in the first quarter of the seventeenth century. The booklet notes, jointly written by performers Chiara Granata and Raffaele Pe, present the most pertinent details astutely. This though isn’t a solo album. Counter tenor Raffaele Pe is joined by Chiara Granata (triple harp) and David Miller (theorbo) who singly or together evoke some rich colours from their instruments. They supply dextrous textures for the prologue from L’Orfeo and indeed throughout whether the music is more theatrical and powerful (d’India) or lighter in spirit. Pe has a well-focused counter tenor voice, expressive but not at all florid. With a fine approach to phrasing comes an agile way with decorations. At their finest – and they are close to their finest in the Nauwach-Caccini Amarilii mia bella – they never take this old favourite for granted. The vocal line is refined, the accompaniment deft. The more urgent imprecations of Francesca Caccini’s Dispiegate guance amate are similarly well done. It’s in the d’India Ancidetemi pur (Lamento di Giasone) that Pe’s tone is at its most focused, forward and piercing, his singing of this rich and plangent lament reflecting well on his musical instincts. To add variety there is a harp solo, the excellent Toccata by Giovanni Maria Trabaci and a couple of echo arias – one, in part at least, is Girolamo Montesardo’s Hor che la nott’ombrosa. There is also, rather unusually, a contemporary work, Solo e pensoso by Alessandro Ciccolini, which is itself a homage to the genre, and sounds part of the continuum of seventeenth-century music. The church acoustic is very pleasing. 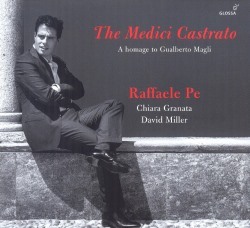 Even in the welter of counter tenor discs, Pe’s precisely targeted concept album rewards close listening.